I bake on most weekends. It's just me and if I don't something is definitely not right! A few weekends ago I had the urge to make something with left over bananas that had been in my fridge for more than three weeks. Yes, you heard me ... three weeks! Surprisingly they weren't mushy at all, just slightly darkened. To be frank I didn't have much time that week as I was baking a cake for a friend's grandfather's 100th birthday. 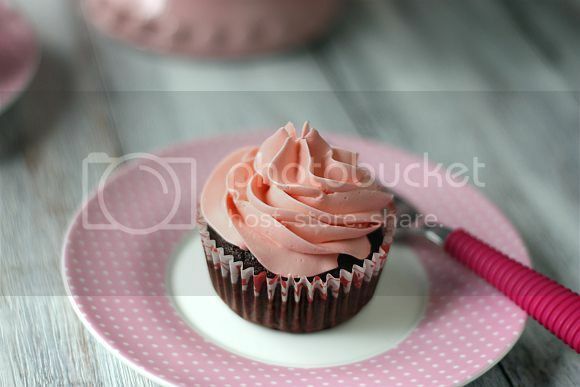 So I wanted to do a quick cupcake recipe and came across this one from Joy of Baking's website. I have tried numerous recipes from here and every one turned out wonderfully. Even though I was really tired from putting the birthday cake together, I still wanted to do something to take to office the next day. The other incentive was that I had quite a bit of Swiss Meringue Buttercream left over which would do nicely on the cupcakes. 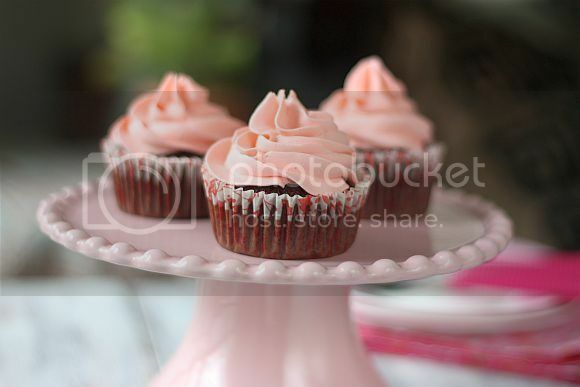 If you are looking for a light and delicious buttercream recipe, I highly recommended a Swiss Meringue Buttercream. It is absolutely gorgous and smooth. 1) Preheat oven to 180C or 165C for fan-oven. Line 12 regular-sized muffin cups with paper liner. 2) In a large bowl whisk together the sugar, flour, cocoa powder, baking powder, baking soda, and salt. 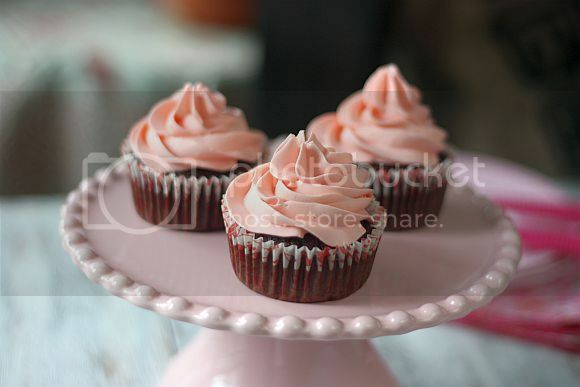 5) Frost with your favourite frosting or with Italian Meringue Buttercream. 1) Place sugar and egg whites in the heat-proof bowl. Set bowl over a pan of gently simmering water, and whisk continuously until sugar has dissolved and egg whites are hot to the touch, about 3 minutes. Test by rubbing the mixture between your fingers; it should feel completely smooth. 2) Transfer bowl to a stand-mixer bowl. Using the whisk attachment, beat on high speed until mixture has cooled completely and formed stiff and glossy peaks, about 10 minutes. 3) Add the butter, one piece at a time, and beat until incorporated after each addition. Don't worry if the buttercream appears curdled. It will come together after a while. Continue beating until smooth and fluffy. Add vanilla, and beat just until combined. 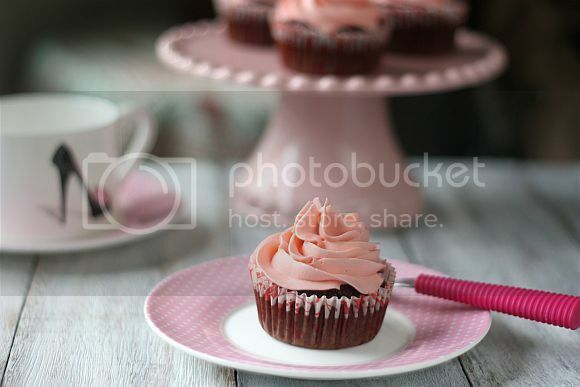 Oh my gosh, besides loving your lovely cupcakes...I adore that cake stand, cup and saucer set you have there! Pink is the way to go, sweet! Great looking cupcakes Jo! Btw, you mentioned Italian Meringue buttercream, but your recipe is Swiss Meringue, is there a typo error? :p I love swiss meringue buttercreams too! Hi Jane, thanks for spotting this. I know I made a meringue buttercream but as I was typing this I could not remember if it was Italian or Swiss. So the header and recipe is correct except for content .. haha! Yes I love this too and so much easier than Italian Meringue. Hi Bee Bee, thanks. I think the whole set up is sweet too .. pink for the little girl in all of us. These are so pretty. May I know how long can I keep the Swiss Meringue for the leftover? Hi Ann, you can keep the buttercream for about 4 days in the fridge or about a month frozen. If in freezer, bring it down to the fridge to defrost a day before and then take out to room temperature. Once soften slightly, whip it back to soften. I was lazy and used a spatula instead and whipped it vigorously by hand. It was good to use after that. they are really girly and pretty ... feast for the eyes too! 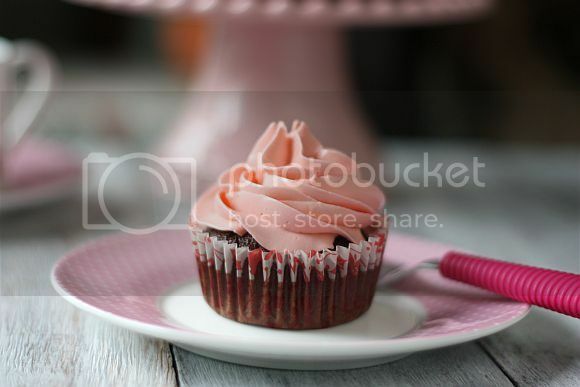 Love the beautiful frosting, the colour is sweet! love this! i also love the color scheme you picked even though it's banana. way to be original! yummy! this sure looks good enough for a 100th birthday celebration! I made these cupcakes this afternoon and I can honestly say that they were the best I have ever had! No, really! The perfect crumb, sweetness, banana flavor and just the right amount of chocolate.Perfect!